Kyrgyzstan still remains one of the few, truly off track and intrepid travel destinations on Earth, and what sets it apart from some other unexplored places is that it’s actually quite well set up for tourism. Guest houses and yurt stays are set up throughout the country, the entry visa is a breeze and there is a great network of local transportation to get you from place to place. On top of that, Kyrgyzstan is a nation blessed with endothermic lakes, towering mountains, fish filled rivers and some of the most hospitable people in the region. One of the main reasons that many people visit Kyrgyzstan is for the countless trekking and adventure opportunities on offer here. From easy day hikes to multi-day excursions on foot, on bike and on horseback, Kyrgyzstan is an adventure traveller’s paradise. 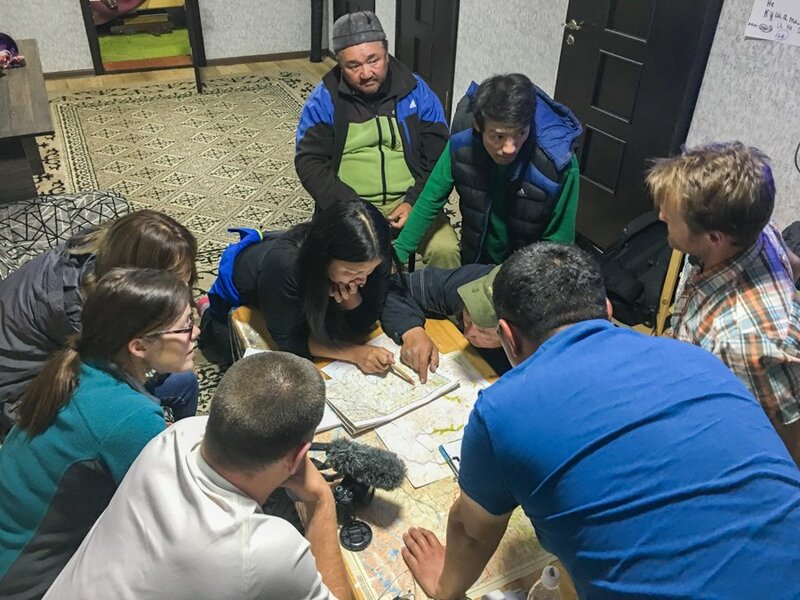 We’ve travelled to Kyrgyzstan two times, and we even helped plot a new trekking route for the country’s tourism board in 2017. In this post, I’m going to list the 5 best treks in the country. If you’re an avid trekker, or just a person who loves to get out and see the outdoors, then this post is for you. We were recently contacted by World Expeditions to help share some of their adventure tours around the region. 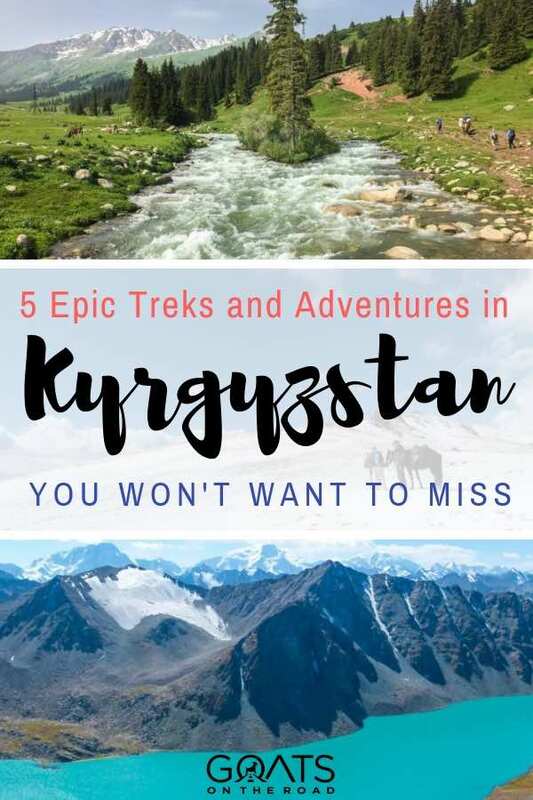 Because we first visited as part of a longer, backpacking trip, and then later as part of a press trip with the Kyrgyz Tourism Board, we haven’t had the opportunity to take a multi-day tour in Kyrgyzstan. Having researched sustainable tour operators now, we’re happy to include World Expeditions in this post as we would definitely look into some of these experiences with them on our next trip to the region. This article was made possible by World Expeditions. They’ve introduced us to many of their trips that we didn’t know about while in Central Asia. As always, all thoughts and opinions remain our own. It’s important when you’re planning a trekking trip that you have the essential items in your pack. The optional items below are for the trekker who is taking things a little bit more seriously, but they aren’t necessarily needed for any of the treks I’m going to list. 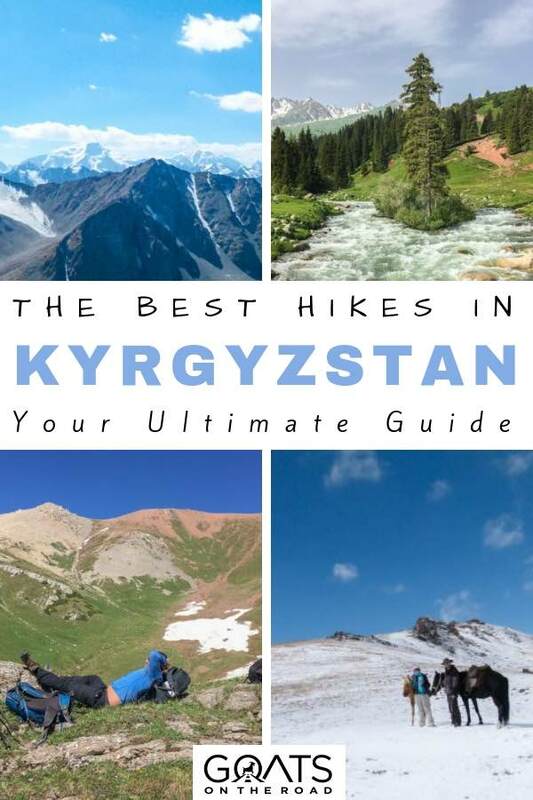 When planning a trekking journey through Kyrgyzstan, it’s important to consider how you plan to travel, where you will stay, how you will get from place to place and whether or not you want to join a tour. There are many tour operators throughout Kyrgyzstan that offer day treks, and multi-day treks both on horse and by foot. World Expeditions has long been a leader in exceptional trekking excursions around the world and they have some excellent tours on offer in Kyrgyzstan, including many of the treks listed in this post and more. If you’re looking to join a tour in Kyrgyzstan, you can check them out at WorldExpeditions.com/Kyrgyzstan. They have more than just trekking opportunities in the country. Many of their other tours include bicycle trips through the country and a multi-country Silk Road tour that looks amazing. The cycling trip includes numerous heli-cycling adventures, while the Silk Road tour takes travellers along one of the most iconic trading routes in human history all the way from China to Kashgar. These trips are well-rated, well-organized and will make for an unforgettable adventure. If you have some time to yourself before or after a tour, or if you’re travelling the region independently, USAID has set up numerous tourism offices in many of the biggest trekking villages in the country, so always ask around for the “Destination Tourism Office” to get valuable information about your proposed independent treks (ie: Destination Karakol Office, Destination Jyrgalan Office etc.). There are also companies like CBT and Shepard’s Life that have great community based tourism projects that give back to the locals in many places around the country. This is something we’ve yet to experience in any of the Central Asian countries, but after travelling through Kazakhstan, Kyrgyzstan, Tajikistan and Uzbekistan overland and seeing countless cyclists, we would definitely like to try it one day. The main reason we didn’t do any cycling was that it’s a bit difficult to organize while in the country. Most cyclists had brought all of their own gear as finding adequate rentals and repairs for bikes on the Silk Road is not easy. If you do decide that you want to cycle through the region, World Expeditions has an epic 13 day trip through Kazakhstan and Kyrgyzstan on mountain bike. If you don’t want to travel with your own bike, they do have rentals available and they also carry basic repair tools and spares in case of an emergency. What sets this experience apart is that you get two days of adrenaline pumping heli-biking around the Karkara Base Camp. A truly once in a lifetime experience for cyclephiles and those who enjoy an adventure. We were fortunate enough to enjoy a helicopter ride over the Pamir mountains during our trip to Central Asia, but we had to roll the dice in order to get on the chopper (they only go once every few days and you can’t guarantee tickets) and we didn’t get to finish off our experience in the helicopter with an epic downhill mountain bike ride. When we go back to the region, this is definitely an experience that will be on our adventure to-do list. But the heli-biking adventures aren’t the only reason to cycle across Kazakhstan and Kyrgyzstan. You’ll pass through rural villages, alongside charging herds of semi-wild horses and roaring rivers, through deep canyons, over breathtaking passes and through flower-clad summer pastures. By traversing this dramatic landscape by bike, you’ll have the opportunity to get up close in personal with the nomadic culture and the natural beauty that is starting to put Central Asia on the adventure traveler’s bucket list. This is still one of our favourite treks to date. Starting from a trailhead just a short drive outside of Karakol, this trek climbs over a 5,416 meter high pass, along a stunning alpine lake known as Ala-Kul, and down a spectacular valley before arriving in Altyn-Arashan, a tiny high-altitude village with a few guest houses, camps and best of all… hot springs to soothe your aching muscles after a long, 2-day trek. World Expeditions also includes Ala-kul in their Kyrgyzstan and the Tian Shan Mountains tour. You’ll arrive here after a visit to Son-Kul. 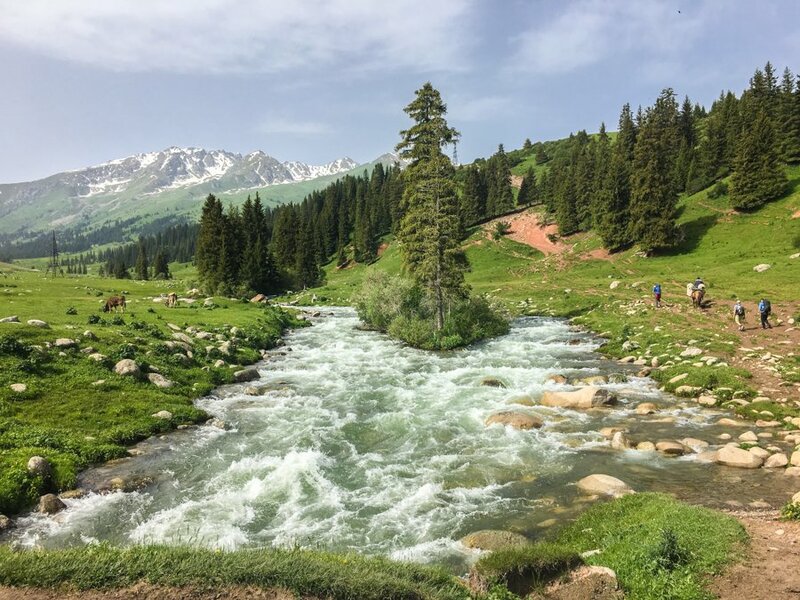 On this tour, you actually get a considerably more trek than we did because you begin by hiking over the breathtaking Telety Pass before descending into the Karakol Gorge. Then on day 9 of the tour you hike over the Karakol Peak and down into Ala-kul lake before visiting the hot springs in Altyn-Arashan. 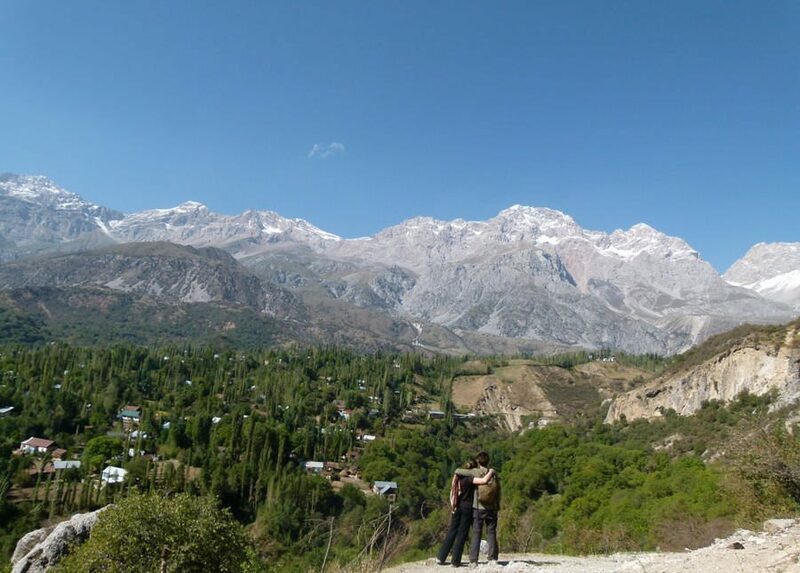 Extending this trek the extra days and having the opportunity to see the lesser hiked Karakol Peak and over the Telety Pass makes this an intrepid and exciting option for outdoor lovers. It is possible to do the trek without a guide, but we did get lost during our time on the trail, so it’s much easier if you have a local guide or are with a group. However you do the trek, you should be reasonably fit as there’s a considerable amount of steep uphill climb at the end of the first day, and the beginning of the second. Check out our guide to trekking to Ala-Kul and Altyn Arashan. Another one of our favourite experiences in Kyrgyzstan, we actually ended up doing the Son-Kul trek on horseback, which we highly recommend. The treks can easily be booked through World Expeditions as well. 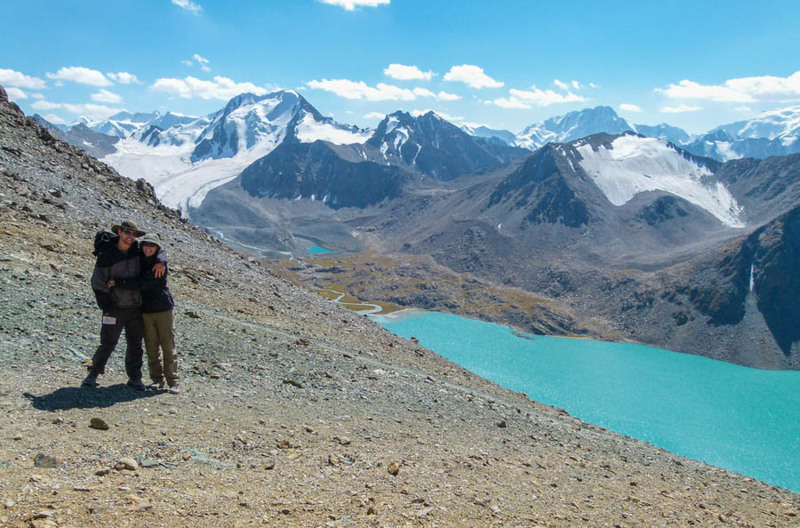 If you choose to take their 15 day Kyrgyzstan and the Tian Shan Mountains tour, you’ll take in Son-Kul lake on day 4 of the tour and you’ll even get to see a yurt being built (something our independently booked tour didn’t include). 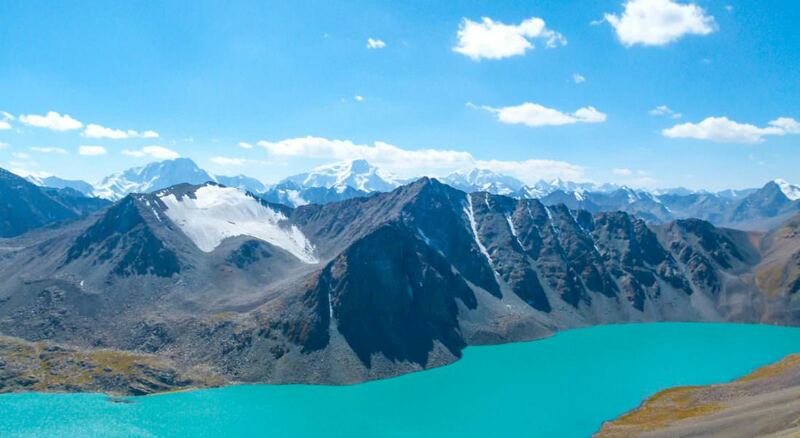 Once at the lake you can take hikes around the beautiful water’s edge and through the emerald-green summer pastures while gazing up at the spectacular Tian Shan mountains all around you. You can also trek to the lake by horseback or on foot. The trek takes a total of 3 days with one night spent before the 3,700 meter high pass, and another spent at the lake. From the lake you can either continue to ride your horse back to Kochkor, or you can hire a taxi back to town (as we did). 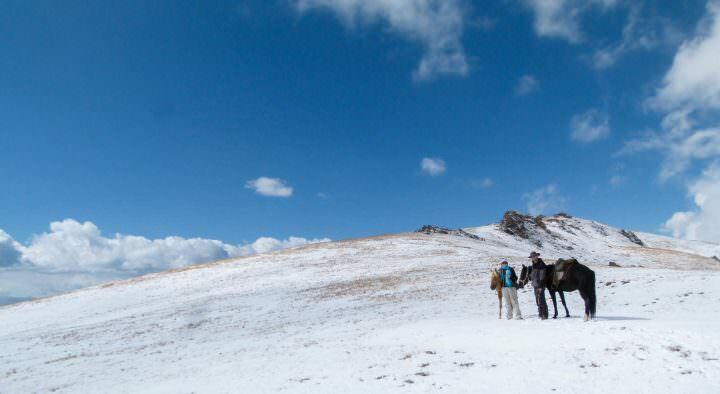 If you’re interested in this trek, check out our experience horse trekking to Song-Kul Lake. This is the trek that we helped plot in 2017 and it remains one of the most intrepid and exhilarating things we’ve ever done in travel. We went into the unknown and unchartered mountains of Kyrgyzstan with a few local guides to try to find a way around the towering peaks near Jyrgalan. After 5 days, we made our way back to the starting point, successfully plotting one of Kyrgyzstan’s newest and most breathtaking treks today, the Keskenkija Loop. Starting from Jyrgalan, the trek takes you through stunning meadows (jailoos), past local family yurt camps, over 5 mountain passes, along glistening rivers and finally back to the charming village of Jyrgalan, where you can relax, unwind and enjoy local food and tea at one of the many yurt stays. It is recommended that you go with a guide for this trek, particularly one with a horse because one of the rivers during the trek can be impassable for much of the year. To book a horse guide at the local price, visit the Destination Jyrgalan Office or contact them on their website. There are so many great day hikes and treks around Arslanbob, that I actually recommend you just go there, talk to CBT and start booking trips. 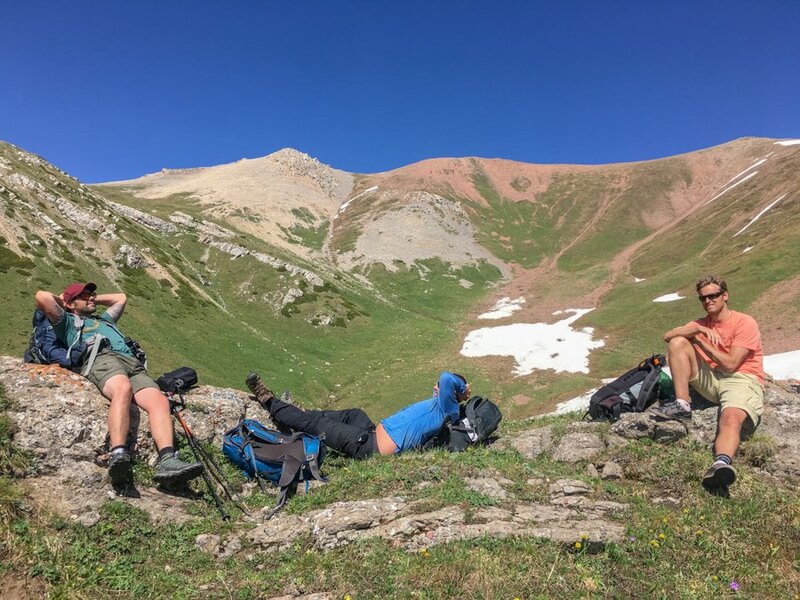 You can do the 4-day trek up to The Holy Lakes, or you can choose from numerous day trips like the hike to the Walnut Groves, or to the nearby waterfalls. Arslanbob itself is probably the most charming village in all of Kyrgyzstan and it’s well worth a visit. The people here are friendly, there are some great restaurants and CBT has set up dozens of different tours including fishing, hiking, meeting families, cooking classes and more. I recommend spending at least 5 days in Arslanbob and more if you plan to do any multi-day treks. You’ll be hard pressed to find a more naturally blessed nation than Kyrgyzstan and if you’re a trekker, you should get here before the secret gets out. Whether you want to experience local culture during off-track hikes like the Keskenkija loop, or you want to rest your legs and explore high-altitude lakes on horseback during the Son-Kul trek, you can do it in Kyrgyzstan. I’ve only listed a few of the trekking opportunities available in this post, but there are dozens more to choose from. There’s something for everyone in Kyrgyzstan and it still remains as our favourite place to visit in the region. 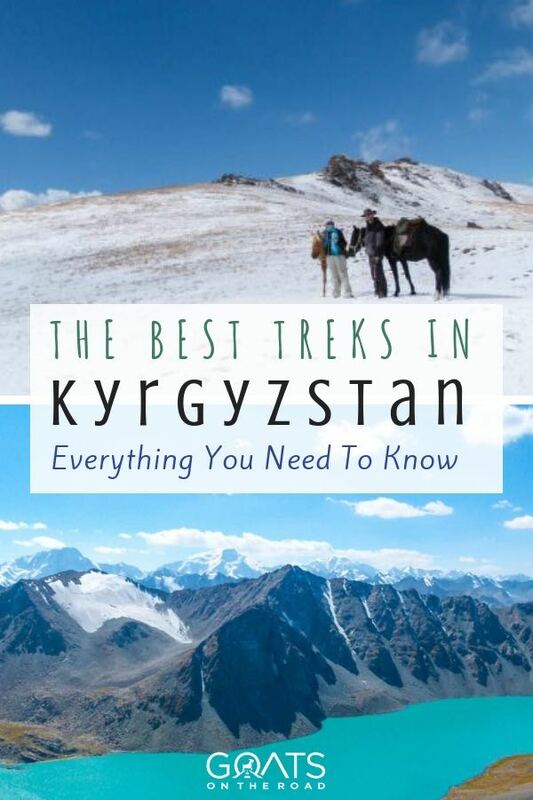 For more about travelling in this incredible country, check out our Ultimate Guide To Kyrgyzstan Travel and our Kyrgyzstan videos. This is a truly epic and intrepid journey up to the 7,134 meter high peak of this impressive mountain that straddles the Tajikistan – Kyrgyzstan border. This is the second tallest mountain in the Pamir mountain range, which says a lot because the Pamirs boast many goliath mountains. You’ll need to spend some time at altitude, acclimatizing to the conditions so that your body will be able to make the ascent to the top. To join expeditions to Peak Lenin, you’ll need to have your body in a very high level of fitness, you should have some basic mountaineering skills and some previous experience at high altitude. Because there are so many acclimatization days to reach the peak, many excursions will last over 25 days, many of which are spent on the mountain itself. You’ll need to push your body to reach the peak, but with proper guiding, it can be done. If you choose to join a Word Expeditions tour to Peak Lenin, you’ll have the advantage of being guided by Soren Kruse Ledet, a true veteran at trekking this part of the world. 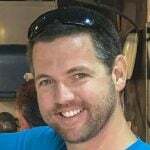 He is a high altitude mountain guide from Sydney, Australia and for the past 23 years he has led and participated in more than 50 mountaineering expeditions and treks in Nepal, Bhutan, Pakistan and Tibet. In 2011 Soren even managed to reach 27,500 ft during an unassisted ascent of Everest. If you want an experienced guide, you can’t ask for much better than Soren. Be sure to check ahead of time if Soren is leading this trek as it isn’t a guarantee every year but if you get the chance, do it! It would be a once in a lifetime experience.